I went down to Kingfisher Inn and spent the night with Rosie, so I'd be there early for the windless dawn that was forecast. My brother Chip came down at dawn and joined me on the water. We knew we had only a few hours before the cold front would blow us off the water, but until then it was calm and moist from the showers that were blessing us with a bit of precip after months of very little. We took the Stilt out and headed for a lagoon where we usually fish in the 'deep' sections that are only 1 foot deep in the highest of tides. 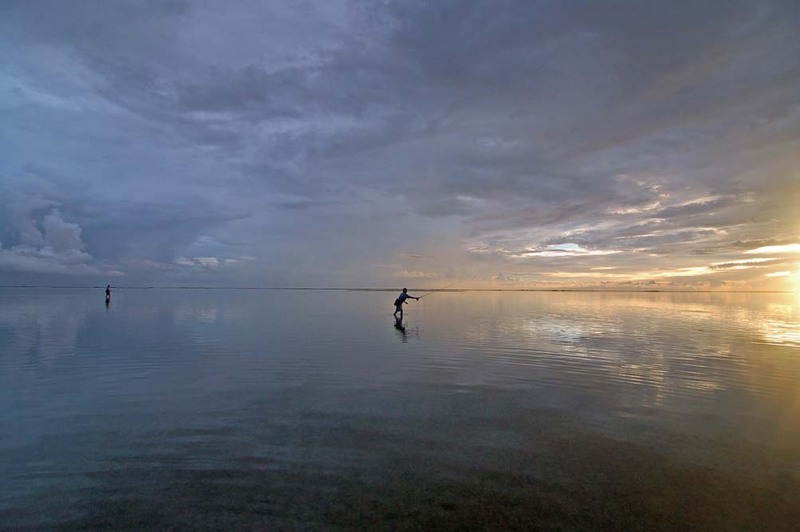 We are fortunate that the Stilt can go there just about any time. Chip was driving, and asked me, "How far back can we go?" I kept waving for him to continue, because there's an area that looks almost dry in the far back end of the remote lagoon, where reds will venture into 5-7 inches of water looking for baitfish. 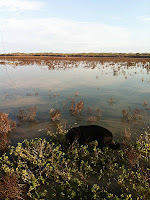 We stopped the boat about 200 yards from the edge of the glasswort sprigs, and waded slowly into the glassy water. Reds were tailing near the boat, and I should have hooked a couple, but my casts always fell to the wrong side, apparently, because none of them reacted. I could have stayed there targeting the tails, but the sounds of exploding reds distracted me from an eventual sure thing. Rosie had been waiting patiently aboard the boat, so I called her and she eagerly jumped in the foot-deep water and took up her position just behind me. We waded slowly toward the shoreline, and registered the location of several actively feeding reds. Approaching the edge of the sprigs, I spotted my first snaking redfish coming up the edge, and casted the pink VIP just off to the side of the sauntering red. It turned and inhaled it and made a blistering run toward deeper water while I tried to clear the line from the vegetation at my feet. As I fought the red, another blew up about 40 feet away, and started showing himself as he swam through the sprigs, his back showing every once in a while, and staying almost visible as I held my Nikon trying to capture him with video while the hooked red pulled my left arm around and pinned it against my side. I wished for a third hand. The action continued for a while. Chip, meanwhile, was fishing to my left along the sprigs, and said several times, "They are up in no water! I don't know how I could land one if even I hooked it." So he stayed put, hoping they would come to him. I didn't care much about landing the fish, only hooking them, so as soon as I landed the 26 inch red, I headed further in, scanning carefully for the reds that would remain almost invisible before exploding like cherry bombs (remember those?) and sending rain minnows airborne in all directions. I only landed two, but managed to cast to several others. In such shallow conditions, it's very hard to get the fish to see the fly without spooking them at the same time. In fine Sparrow tradition, Chip and I punctuated the morning stillness with expletives that would have made Nixon turn red. It was tense and very challenging, the kind of morning that will make you a better angler if you can keep yourself from imploding. I did, but an observer within earshot may have thought otherwise. East Side Magic, part 4. Here's the last installment of the article, which should appear in the winter issue of Tide magazine. I just heard that the photo that the editor wanted to use for the cover (see part 1 of this article) did not scan clearly enough to use on the cover, but--good news--he wants to use another photo of mine that was shot digitally. Here's the photo, which I have titled Sunrise Magic. I guess I'm partial to "magic," huh? The quality and challenge of this sightcasting venue is only exceeded by its beauty. In between fish, Dave and I remarked at the dream-like quality of the scene ahead of us, in which the sky was perfectly reflected by the unbroken surface. An unnamed client of mine, who was so moved by the pristine beauty of the sand on a calm morning, said that he didn't need to catch fish at all to make it worthwhile. He went on to imagine holding hands in groups and singing Kumbaya, and at that point I interrupted his fantasy, thinking he'd gone a bit too far. As Dave and I quietly enjoyed the beauty of the scene, and scanned ahead for more tails, I told him of fishing the area with my friend Pete Prata the week before, in which Pete and I would approach each pod with the intent of a double hook-up. Pete, who was spin fishing at the time, gladly accepted the exquisite burden of making the first cast. With my encouragement, he would approach from the south and cast his gold spoon near the pod. I would, in turn, approach the fish from the west. Once Pete cast his spoon into the fish, usually hooking up, the reds did what they always did––head west for deeper water. By anticipating their departure route, I was able to cast my fly head-on to the broken pod, often hooking a second red within moments of Pete's hook-up. The great thing about this action is that the area is hardly fished. During weekends, in particular, game fish will migrate onto the sand, in part, to escape the crisscrossing boats. But sheer avoidance of boat noise does not account for the main reason the reds can be found in such conditions. Indeed, a careful observation of the sandy bottom reveals almost continuous tiny perforations and trails made by worms and crabs that live mostly beneath the sand. Besides these pinhole-size openings, larger "divots" give testimony to the efforts of bottom-feeding sheepshead, black drum, and redfish to rout these food sources from their hiding places. The boats capable of entering this area at lower tides comprise a distinct minority, and the anglers who know enough to park their deeper-draft boats and wade onto the sand on a calm morning are few and far between. But while the outward appearance of barrenness turns most people away from the sand on a dead calm morning, the redfish know better. And those of us who are willing to make the counterintuitive call to go east instead of west on a calm morning on the Lower Laguna Madre may be rewarded by unparalleled sight casting opportunities. Capt. Dr. Scott Sparrow is a fly fishing guide, psychotherapist, professor, cofounder of Kingfisher Inn (www.lagunamadre.net), and author of Healing the Fisher King: A Fly Fisher's Grail Quest(www.lagunamadreflyfishing.com). East Side Magic, part 3. I'm going flyfishing tomorrow, so I will let you know how the fishing is. Meanwhile, here is Part 3 of "East Side Magic." Autumn is perhaps the best time for this action. In summer, the game fish will leave the sand by midmorning in response to the warming conditions, but the cool water of October and November will keep the reds feeding on the sand all day, especially if the sky is overcast. 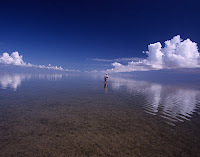 Normally, one wants a cloudless sky for fishing the sand, but on calm days when the fish are feeding in seven to 10 inches of water, they can't help but show themselves. 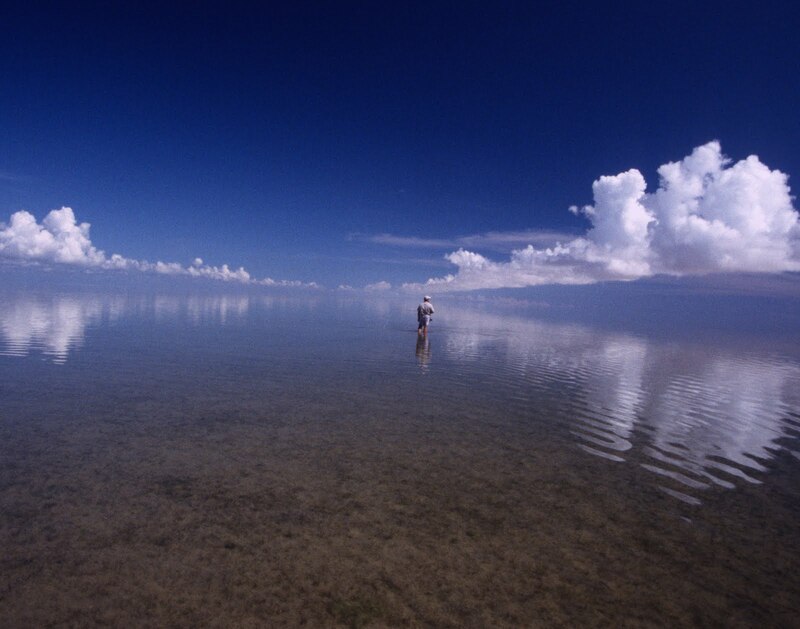 Under such ideal conditions, clouds keep the sunlight and temperatures low enough to satisfy the prowling fish. On that November day, we had a mixture of clouds and sun, but the cool water and available food sources offset any warming effect of the subtropical sun. I sensed immediately that the action would be good as long as the wind remained below 10 mph. Spotting two tailing reds moving toward us, I poled the Stilt within position to intercept them. As we drew closer, I imagined that I could hear Dave breathing roughly. It's not an easy thing to succeed in such clear and shallow conditions where every false cast can alert the fish to our presence, and every imperfect presentation may be the last one before the fish explodes and flees in indignation. Failure comes easily when every sound and every movement seems to offend the stillness. I found myself holding my breath and freezing in place as Dave began false casting to the reds, which had already sensed our presence, and turned slowly away. They could still be caught, I realized, so I coached him on the placement of successive casts. Alas, the increasingly annoyed fish swam beyond the range of his best cast. Dave apologized profusely, blaming himself for the miss. I reassured him, knowing that success was imminent under these conditions. The second opportunity was a single large red approaching head-on from out of the pewter-like sheen to the east. Dave tracked the redfish's snake-like signature through the skinny water until it was about 40 feet from the boat, and closing. He made a couple of quick false casts to get enough line aerialized, and then dropped the size 6 Clouser three feet to the side of the approaching fish. The red swirled and rushed to the fly, and went head down on it before Dave could even strip. "Get ready, get ready," I said in a hushed voice just before the big fish sensed his predicament and sped past the boat at a blistering pace. The line ripped audibly through the water, and the drag screamed. Dave stood silent and intent on the deck of Stilt, holding his rod high and knowing full well that if the fish was going to break off, it was going to happen right away. I said, "Let him go, let him go. Just stay tight. He's stop eventually." East Side Magic, part 2. Planing into nine inches of vegetation-free, gin-clear water can show you everything that's there, but such intelligence comes at a high price. Every redfish within 300 yards will summarily spook ahead of the encroaching boat, and can therafter be observed as silvery V's moving slowly toward deeper water. Gamefish tend to be wholly intolerant of noisy intruders in this most-sensitive area of the LLM, where any semblance of cover is at least a mile away. Taking up a position on the poling platform of my NewWater Stilt, I went through my well-practiced orientation speech so Dave could muster the requisite patience without losing enthusiasm for what was to come. "These fish will be larger than average, and spread out," I said. "It may seem impossible to approach them, but they are feeding, and they're not looking up. So we should be able to get close enough for you to reach them." I then added, "Try not to cast before you are pretty sure you can place the fly within three or four feet of their heads." I urged him to practice his cast while I moved us slowly beyond the empty zone that we'd created by our arrival. After about 15 minutes of poling eastward toward the distant dunes of Padre Island, we entered the edge of unmolested water and, since the winds were still imperceptible, we began to spot tailing fish ahead of us on the mirror-like surface. They were easy to see; for while the redfish barely tail on the sand as they move forward at a slight downward angle, there was nothing else to compete with the occasional nervous water and surface breaks of the feeding fish. Above the bright sheen, we could see the occasional dark tips of tails, and then track their movements beneath the water without much difficulty. As I expected, they were spread out, such that each small pod was 75-100 yards from the next one. I knew that the distance between the tailing fish was advantageous to us, however, because every fish within 50 yards would surely flee the moment Dave hooked up on the first redfish. Stay tuned for part 3., which will appear in two days! My client Dave Cole had never flyfished for redfish on the Lower Laguna Madre, and had come down from north Texas to see what it was all about. After catching his first two reds from tailing pods in a west-side lagoon, I suggested that we go elsewhere. He must have been a bit worried that we were committing the fundamental error of leaving fish to find them. But I could see that the action was falling off, and another place called to me. A calm morning is a rare thing on the Lower Laguna Madre of deep south Texas, but during the summer and fall––between the fierce winds of March and April, and the disruptive cold fronts of late Autumn––mornings often dawn breathless on the shallow estuary. At daybreak on a calm morning, sight casting can be superb just about any place you go. Most of my guide friends head to the west side of the lagoon, into the seagrass meadows of such storied places as Paytons, Cullens, and Rattlesnake––bays named, respectively, for a local angling family, a wealthy Houstonian, and our indigenous pit vipers. In these fertile places, the reds will tail in earnest in a foot of water or less as they root head-down through the shoalgrass for shrimp and baby blue crabs. It's hard to improve on the heart-stopping sight of waving tails spread across a west-side lagoon on the Laguna Madre. But experience has taught me that there can be something even better if I'm willing to go in search of it on the east side. I know that beyond the sheer chaos of mullet and sheepshead that congregate on the east side sand, above-average redfish in small pods can be found feeding even further east in otherwise empty water. See the next installment in a couple of days! I have said that the context determines your fly choice, at least in a fishery where the fish are not selective, as on the Laguna Madre. I use only four flies for 95% of my fly fishing: the VIP popper (March through November only), the Kingfisher Spoon, the Mother's Day shrimp pattern (or Crimp as an alternative), and the Clouser. That's it. Regardless of what anyone tells you, you don't need more than these four flies. Of course, there are other great flies, but each of them is roughly equivalent to one of my four choices, but probably inferior for various reasons. You need a weedless popper, not only for great action, but for line management in conditions that are too grassy for anything else. The popper needs to cast easily in the wind, break the surface tension of the water without sinking (so it stays in place during the strike), not make noise on the back cast, and produce a high percentage of hookups (with a wide-gap hook). The VIP does all of these things. It's easy to tie, and cheap to tie. You need a spoon fly in two weights for fly fishing the flats. I usually use the lighter weight only, and switch to a Clouser instead if it's deeper than 18 inches. A weighted spoon is fine, but harder than a Clouser to cast in the wind. You need a light-weight weedless shrimp pattern, or one that doubles for a crab. My Mother's Day fly, or the Crimp, satisfies this need. You can weight some with lead wire, or heavier eyes. You need a weighted fly that casts easily in the wind for grass-free venues. The fly needs to get to the bottom, because that's where the reds will be looking. A size 4 or 6 Clouser cannot be beat. We usually use bead-eye or brass eyes; that is, lighter than lead. Your decision about which fly (and which weighted version) to use also depends on whether you are wading or fishing from a boat. If you're wading you can use a slower sinking fly and lead the fish a bit more so as not to spook him on the cast. However, if you're on a boat, you need a faster sinking fly--to get it to the fish before he looks up, but also to get it down in the water column so he will see it quickly without looking up. I never use poppers from the boat, at least with clients. Typically, clients do not see fish in time to make a long cast to them. So casting a popper to close-in targets will bring the fish to the surface within sight of the boat. That's self defeating. Redfish will always eat--almost. If you use a fly that is suited to the context, then your choice cannot be faulted. If the fish doesn't appreciate your fly, it's probably due to another reason: poor presentation. Next time, I'll talk about presentation errors and how to correct them. Newcomers to the Lower Laguna are almost universally unaware of how willing redfish are to take a fly. Having fished in venues where fish have been more selective, they are ready to blame the fly for what they perceive as the fish's disinterest. In actuality, redfish and trophy trout are almost always willing to take a fly. Indeed, even big trout--which are known to feed for about two hours out of every 24-hour cycle, can be enticed with regularity. So why don't people realize it? I could be here all night answering that one. But suffice to say that it's a combination of factors that keeps the angler in the dark. For one, redfish and trout don't see flies that aren't at the level where their attention is focused. A friend of mine, who once had the IGFA 4-lb tippet world record trout said that sink rate is the most important factor when fly fishing for big trout. Sink rate? Who would have thought it? But what Tom Kilgore is saying is that a gamefish is usually focused on a particular level of the water column. Reds usually feed head down, and thus overlook just about anything that passes overhead. Trout are also prone to stick their heads in the grass. Still, the idea that the fish should see my fly is a hard misconception to cure. After fishing six hours with my buddy Skipper Ray, his clients asked if they should change their flies. Skipper replied in his customary dry style, "Fellas, the fish haven't even seen your flies yet." So the first thing to overcome is the fundamental error of interpreting the fish's lack of response as disinterest. A big trout or a redfish will almost always react to the sight of your fly. So if the fish doesn't react, it hasn't seen your fly! This is a good starting point in a rather complex analysis that I will be making in the next few postings about fly selection. So as you go to sleep tonight, affirm that the next time you sight cast to fish, and it doesn't respond, you won't blame the fly or the fish. Instead, affirm that you will simply cast again, and hope he sees it. I promised to write about fly selection, and I will, but I thought you'd enjoy hearing about my brother's success fly fishing yesterday. I got a call about 10 am from Chip, who asked me, "Do you have a fire extinguisher on the boat?' I'm thinking, maybe there's a fire, but then I realized that if there was one, he'd probably be overboard rather than calling me on his cell phone. "There's one in the console...I think," I said. "Why do you ask," I added. "Because I'm talking to a couple of game wardens who want to see it." Well, I didn't hear from him for a couple of hours, so I called him to see what had happened. He was excited about the fly fishing, and told me that he and Art had caught several large reds--two oversized, in fact. It wasn't like my brother to ignore the obvious question about the game warden visit, so I had to ask, "What happened?" He said, "We got a ticket, but no big deal." I was impressed that he was able to enjoy the day without fretting over his upcoming visit to see Judge Benny Ochoa. If you can enjoy fly fishing more than worrying about the cost of your mistake, I would say...You're living well. What do you think? The legendary Catskill fly fisher Edward R. Hewitt once said, "The fly is not the problem. It's what's on the other end of the line." For those of us who have fly fished the Catskills -- Hewitt's statement is pretty surprising, because the fish in those waters are extremely selective. Color, size and pattern are crucial variables. But what he was saying, as you probably surmise, is that we tend to conveniently minimize the contribution of the angler, especially when things aren't going well. Instead, we blame the fish, the fly, the wind, and whatever else can conveniently distract us from where the real power lies -- in our hands. 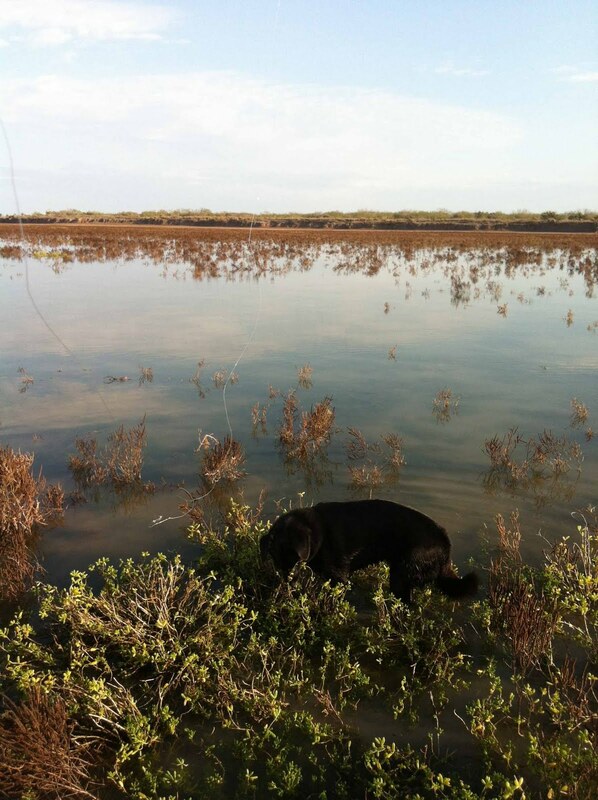 Hewitt's statement is even more true on the Lower Laguna Madre, where the fish are not so much selective as they are uncompromising. More wary than picky, big redfish and trout alike will accept just about any fly at any time that is well presented, and reject all other offerings. Indeed, presentation is just about everything. When we misinterpret the source of our failures by blaming the fly, our failures become mistakes from which we cannot learn. In my next installment, I will discuss fly choice as a function of angler skill and environmental conditions, not the fish's desire.